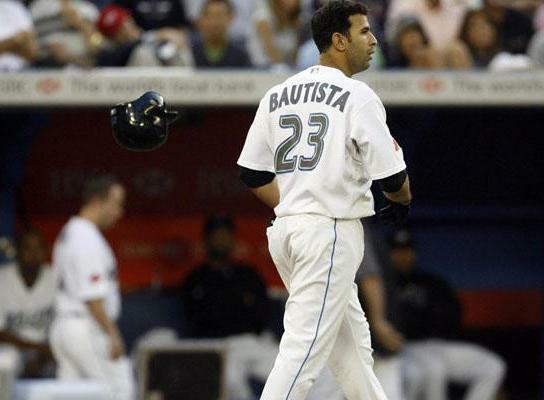 In 2010, Bautista has increased his fly ball percentage (FB%) by an entire 10%. Up from a career average of 44% to 54%. His line drive percentage (LD%) is slightly down (0.5%), thus it leaves his ground ball percentage (GB%) at a 10% decrease. However, he is seeing just about 10% more off-speed pitches this season, including more sliders and curveballs which tend to induce more ground balls. But when he is seeing fastballs, he is taking them out of the stadium (13 of his 14 HR in May and June are off the heater). Bautista is also swinging at 7% more pitches out of the zone than last season, so he isn’t seeing better pitches by looking at pitches out of the zone and ahead in the count. What do these numbers say to me… Sell High on Bautista. These numbers and pace aren’t going to stay, they are all out of the ordinary. So if you own him in fantasy, sell now while you can still get something worth while.